These tube-shaped glass chambers are designed for measurements of oxygen consumption rates in resting/inactive aquatic organisms (e.g. fish or inverts) by intermittent respirometry. These upright glass chambers are designed for measurements of oxygen consumption rates in resting/inactive aquatic organisms (e.g. fish or inverts) by intermittent respirometry. Choose between six different chamber IDs (inner diameter) and the chamber depth that you prefer, e.g. in order to match the chamber volume and dimensions to your specimens and research application. For oxygen consumption measurements we made a basic mini chamber system including the minimum equipment required. 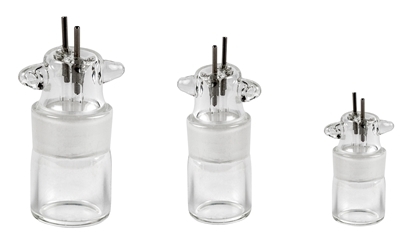 Mini chamber stopper with two stainless needle ports for flushing/mixing the chamber or for injecting sample or substances. 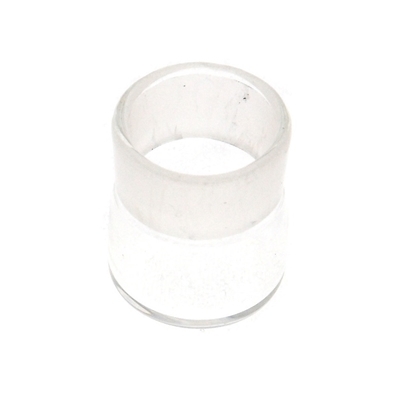 The ground glass joint provides 100% tight seal when the chamber is closed. With this replacement tube you can build a longer or shorter respirometer chamber using a set of end caps from a complete chamber with similar inner diameter (ID). With this replacement tube you can build a deeper or shorter respirometer chamber using a end cap from a complete chamber with similar inner diameter (ID). Use this holder with up to mini chambers ID9-28 mm. To hold chambers of different dimensions, we offer adapter rings that matches the outer diameter of each available chamber. The holder can be mounted inside a water bath for thermostatic control.